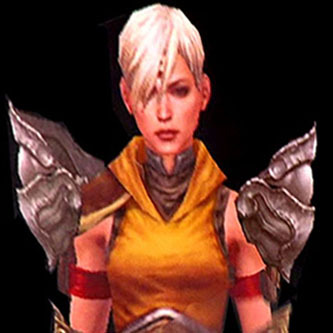 After all the jokes and snide remarks we all made about the silliness of the Jace Hall show as they pretended to film secret material that Blizzard didn’t want them to show, episode 2 of their new season went off tonight and… they debuted the female monk. Not very clearly; but the camera panned across a number of colorful print outs of her various looks, and we’ve assembled the best available images in the gallery. Click any of these thumbs for a larger view. Let’s hope that Blizzard has something bigger and better planned, and that they’ll release some full quality images and screenshots later today, after letting Jace Hall get the publicity and attention for the big reveal. Player reactions so far seem to be fairly tentative, with, “A blonde?” leading the early comments. thanks to FriskyDingo in comments, for the tip. Update: Cleaned up the images quite a bit. New headshot uploaded. Update #2: Full Jace Hall show and summary of the Diablo 3 content on the click through. Update #3: Check MD’s post at BlizzPlanet for lots more screen caps. Jace Hall Show. Season 3, Episode 2. All of the Blizzard and Diablo content was squeezed into two highly-edited segments. 4:00—Diablo 3 design meeting is underway. The table is crowded with developers arguing about ridiculous things. WoW expansion will have a codpiece slot (for females too?). Suddenly Chris Metzen stomps in and says he has a World of Warcraft design meeting going on upstairs and that he, “needs the gun.” Much shouting ensues, Jay Wilson angrily asserts that he couldn’t give, “two **** about World of Warcraft,” and Chris retorts that Diablo 3 has been under dev for like 6 years, and that WoW is “keeping the lights on.” Metzen eventually is given the gun, a neon-yellow plastic toy that fires suction cup darts, and he takes Jay Wilson’s pirate hat as well. 6:45—The meeting continues, now with Jay Wilson wearing Jace’s baseball cap and Jace wearing a cold, hairless head. No one else in the room has a hat on. Jay is their leader. Jace begs to be shown some secret stuff, which he swears he will not divulge. At the 7:20 point the “are you filming our design board? !” moment that was shown in the season preview happens, and immediately after that they cut to footage of the female Monk concept art and game render. At 8:00 Jace grabs one of the print outs and runs for it. Much shouting ensues. That’s it for the Blizzard material, though the show ends with a tease of next week’s show, with Starcraft 2 stuff, including some sily jokes about how they balanced Starcraft 1 via what looks like beer pong.